There is a central contradiction at the heart of the construction of Pakistan. A state that was created to protect a minority nation was, and still is, wholly unwilling to extend the same kind of protections to its minorities. A 2012 protest against Shiite genocide in Karachi. Demotix/ppiimages. All rights reserved.Pakistan’s birth in 1947 was not revolutionary in the traditional sense of the word. Though conceived and incubated by Muslim politicians in India, it was given a permanent character by the British parliament, gaining royal assent from the Queen in August 1947. Yet the appearance of Pakistan on the world map was profound in more than one way. Firstly, Pakistan’s ideological origins lay not in claims to language, ethnicity, or shared constitutional values, but a distinct ethno-religious identity, the first of its kind. Second, what followed immediately after its creation was nothing short of carnage, where people were uprooted, families torn apart, and cities and villages submerged in a bloodbath. What really stands out in the events that led up to the creation of Pakistan was the claim that Pakistan as a constitutional arrangement was an optimal, in fact the only, solution that could guarantee the rights of Muslims in an independent, confederal India. What initially began as a movement to safeguard the rights of minorities eventually transformed into a demand for a separate state, and, in one sense, marked the transition of a minority ethnic group into a ‘nation’, albeit a minority one. After a prolonged battle against the British Raj, and then the Indian National Congress, the Muslim League discarded the phraseology of minority rights and affirmative action, and raised the stakes by jumping on the generally misunderstood Wilsonian idea of nation-states. Yet what is remarkable about this movement is that a state that was created to protect a minority nation was, and still is, wholly unwilling to extend the same kind of protections to its minorities. Pakistan’s founder, Muhammad Ali Jinnah, had guaranteed the rights of minorities in the new state of Pakistan, giving them the same rights and responsibilities by making them equal citizens as anyone else. While the perennial debate about whether Jinnah envisaged a secular or ethnocratic state stands unresolved, it is safe to argue that whatever shape or form Pakistan’s political system would have acquired under Jinnah’s leadership, Jinnah himself did not view Pakistan’s new minorities as second class citizens. And naturally so. By declaring Pakistan’s religious minorities as essentially fifth columnists from the very outset, Jinnah would have run the risk of blemishing Pakistan’s record by making it a pariah state in the eyes of the world. Moreover, it would have undone the efforts of the Muslim League to secure political alliances with diverse parties and, most importantly, discredited the very raison d’état of Pakistan, that is, minority rights. The problem, of course, was that the League did not last long enough to mould the state in its own image, and the rest is history. Fast forward to today, and Pakistan has one of the worst human rights records in the world. Far from being equal citizens of the state, Pakistan’s religious minorities are an easy and open target for anyone who wants to settle scores by using the notorious blasphemy laws. That Pakistan’s minorities are third-rate citizens has been highlighted repeatedly. But what is really astonishing is not state inaction. Rather, it is the failure to diagnose the origins of the problem, which stems from the nation’s selective amnesia. Pakistan’s current woes actually predate its foundation. The rather spurious claim that Muslims represented a nation in British India created a political and conceptual quagmire that, with the achievement of Pakistan, marked a point of no return. The overwhelming emphasis on religion as a binding force amongst the Muslims of India created tensions with other ethnic and linguistic identities, and these tensions soon resurfaced in the immediate aftermath of Pakistan’s birth. As a country created to provide ‘sanctuary’ to India’s Muslims, it was no longer possible, even if leaders like Jinnah had hoped otherwise, to shape the identity of the new state that was totally devoid of religion. The Muslim League had stoked religious passions to galvanize Indian Muslims under its banner and it could not therefore speak in a neutral, secular language. Although references to Islam were not uncommon in Jinnah’s speeches, it is largely mistaken to assume that the Muslim League sought to establish a theocracy. After having achieved Pakistan under the mandate, albeit limited, of the Muslim majority areas of India, no astute politician would have alienated its newly found and most powerful constituency by talking explicitly of secularism and democracy, the very words that had made some Indian Muslims uncomfortable. At the same time, the Muslim League was neither a confessional party nor a social movement. It was a formal political party that had served the interests of the Muslim aristocracy and gentry for most of its existence, but had grown to encompass elements of the largely urban Muslim middle class by the time it raised the demand for Pakistan. Though the League was dissatisfied with the constitutional and political system of British India, it did not seek to subvert democracy itself. Theocracy was not an option. This was the conundrum that Pakistan faced. If theocracy was not in the cards, what role would religion play? In his references to Islam, what Jinnah had in mind was the treaty brokered by the Prophet Muhammad between the Muslim and non-Muslim residents of the newly founded city-state of Medina. Jinnah repeatedly referred to the treaty as a model upon which to create a state of equal citizens, not a theocracy or a caliphate. Jinnah, however, died shortly after Pakistan’s birth, and the Muslim League soon found itself in disarray. It was not totally impossible to create a state of equal but differentiated citizens. That was not to be, however, as the political vacuum left by the absence of the League from the Pakistani political scene opened up new opportunities to give the nascent state’s character a new colour. For those who took up the mantle after the League went into oblivion, there existed the challenge of managing the sheer linguistic diversity that was found in Pakistan. The idea of Pakistan would be encouraged through state institutions. And since nation-states are born on the basis of a singular identity, Pakistan’s identity would be first and foremost religious. In order to create such an identity, the most immediate contenders have to be quelled. The first challenge came from Pakistan’s largest linguistic group, the Bengalis of East Pakistan. 1971 marked the failure of the idea of Pakistan to bind people, yet it remained a powerful narrative in the minds of West Pakistanis. With the severance of East Pakistan, a new reality dawned on the Pakistani leadership. In order to maintain that religion was the fundamental force that Pakistanis would associate with, and indeed the basis of Pakistan’s character, Islam would have to be superimposed as the essential fact that defined Pakistan. In constructing the Muslim identity as a homogenous political community, Pakistan inadvertently paved the way for the violence that runs rampant in the country today. 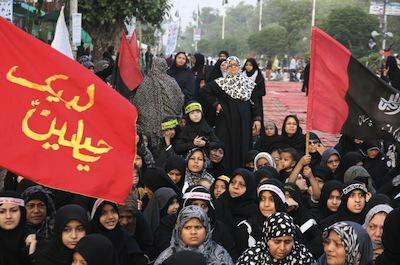 Just as the use of Urdu as the official language had alienated the Bengalis who formed an ethnic majority in the country in 1947, the use of Islam as a monolithic identity post-1971 also serves to alienate the Shiites who form 20 percent of the population in Pakistan. This creates a political problem for groups like the Shiites, the second largest Muslim denomination in Pakistan. They are left without guaranteed representation like that of the other minorities in the government as well as the bureaucracy because they are left under the umbrella term ‘Muslim’. They are conspicuously absent in the eyes of the state. This lack of acknowledgement in the legal texts of the country is subsequently reflected in the rhetoric of the state. It is transmitted to the population at large through a state endorsed educational curriculum which reproduces a distinctly Sunni interpretation of Islamic theology and history. When extremists groups like Tehreek-e-Taliban Pakistan and Lashkar-e-Jhangvi perpetrate mass violence against the Shiites, the Shiite population has nowhere to turn to. The state does not consider it to be a distinct group and therefore cannot possibly acknowledge that this targeted violence exists. Violence against the Shiites is not acknowledged for what it is: sectarian violence. Violence manifests itself in multiple forms. It has impacted Karachi’s urban geography with the emergence and ghettoization of distinctly Shiite neighbourhoods, thus promoting de facto segregation between different segments of the society; it finds expression in the slogans labeling Shiites as infidels on numerous walls and banners across Pakistan’s largest city. These conditions create an alternate ‘social imaginary’ which is markedly different from the constitution of Pakistan. Whereas the constitution assumes the Muslim community of Pakistan to be homogeneous and identical, the reality on the ground proves otherwise. The Pakistani constitution stands at a critical juncture. As long as it chooses to paint the Muslims as a monolithic political group, it runs the risk of alienating sections of its population which prioritize sectarian, linguistic or ethnic identities. Yet, acknowledging the Shiites as a political group can also set a dangerous precedent for other sectarian and ethno-lingual groups which may make similar demands. The cycle of minority rights in the subcontinent has come full circle. Prior to partition, Indian Muslims demanded their rights be protected by the British. When they were no longer content with the status of a ‘minority’, they became a self-proclaimed ‘nation’ and demanded that their rights and privileges should be commensurate with their new status. Once the Muslim leadership was convinced that their rights as a minority nation were not guaranteed because of the looming ‘Hindu majoritarianism’, the League demanded a sovereign state. This lack of acknowledgement by the colonial state created a minority-syndrome amongst Indian Muslims. Now that Pakistan has been achieved, its minorities have essentially become fifth columnists in the eyes of the state and the public at large. A minority-turned-majority nation has created an inhospitable environment for minorities of all stripes. The violence against the Shiites is the manifestation of a political problem arising from the historical failure of the state to recognize the Shiites as a minority group. Coupled with the dominant narrative of identity in the Islamic Republic of Pakistan, it leaves out the Shiites from the state discourse. Offered no representation or legal recourse, the Shiites are also left without a guaranteed voice in the state and the bureaucracy. Pakistan must acknowledge the Shiites as a minority and extend to them the same protection that it does to other minorities.